I don’t know if they sell directly on the site. I hope this info helps. Thanks for your interest. That’s interesting. Not sure how NPR got a hold of it. Kate may have given it to someone. There is a living-room recording of Rufus, Martha and Kate doing D’ou viens-tu bergere. It’s from the early 80s I think. It will be up to Rufus and Martha to release this. I’ll mention it to them and maybe they know where the song is. I’m still looking for a distributor for Odditties in the UK, US, Europe and OZ/NZ. Times have changed. Pronto Monto is owned by Warner Bros and they’ve never released it on CD. I’ve asked to license it but it’s unlikely they would let me as I’m not a full-on label. I don’t know why it can’t be available as a download, for that matter, Dancer with Bruised Knees. There is a deluxe edition of our first recording, Kate & Anna McGarrigle, slated for release at some time in the near future. Warners would include a disc of some early demos in this package. I’m not sure I know what recording you’re talking about. The 80s were not a good time for us. Couldn’t get killed but that didn’t stop us from writing and recording in studios we couldn’t afford. How can I find out? We did copyright things and probably sent a tape to the LofC. Would love to hear it. Yes. Rhino was going to release our 3 Warner records + demos. We never really got back to them. Too much stuff going on. Then Kate died and Nonesuch has stepped in to re-release a deluxe of the 1st record only with early demos. Not sure what is going to happen with Dancer and Pronto. They hold the cards. I have another compilation I’m working on. All the songs were done to a drumatix drum machine. We started slowly sorting the tracks about 2 yrs ago. It was to be called Songs of Roland. Soon. Was my Brother in the Battle is much more beautiful on Odditties than on Songs of the Civil War. It was the demo we sent to get the gig. I have suffered from demo syndrome my whole life. Kate too. available on cd in canada only for the time being. available on cd in Canada only for now. I see what you meant about spam. Perchance ’tis I who be sans compos. Calm down now Anna and relax with a cuppa, its only technology. Thank you so very much for making Odditties available to us/to the world. It’s beautiful. “More, more! !” is what I think when I listen to it (“over & over”) but I’ll just remain humble as this is already fantastic. I ordered my copy last Wednesday through Outside Music and already received it last Monday. Fantastic service as I live in the Netherlands and shipping went superfast. Thanks Dennis ! I saw you and your sister (and family) a few times over here, those were really great events. I regret (forever) that I wasn’t able to attend the London Christmas show at the Royal Albert Hall last year. Someone commented just a few comments back that they went to the outside-music.com site and ordered directly. It arrived within days and he’s in Holland. It’s MORE than worth waiting for. Amazon in Canada has started shipping. Yes! My copy arrived on Christmas Eve here in Winter Wonderland (Germany) – perfect timing! Happy Holidays everybody! At last, my copy has arrived here in Oz, joy! Anna thank you for your notes and for sharing such special memories. Please keep singing, jamming and also please keep blogging! There are so many of us around the world who have been moved and inspired by your music. peace and love to you all. I am in the UK and ordered Oddities from Outside Music on 28th December, it arrrived today, in spite of all the postal problems and new year holidays. People certainly don’t have to wait until April to get it here. What a beautiful album, I am loving it. Fabulous harmonies and it will get played A LOT! Ordered Oddities Dec. 22; what with Holidays and Snowstorms, my CD only arrived this past Friday. Such a balm, as my body and mind were by then re-membering the loss of Kate just one year ago. I am so grateful. I also ordered around the 20th of December at Outside Music. Due to European customs it took 3 weeks until the CD arrived – what a fine album! I love it! a fan since my times working in a record store in Munich, Germany in the early eighties. I just got my copy this morning and am going to pop it in the ‘puter right now. No problem at all ordering it from Amazon.ca and getting it sent down here to the States. It only took 5 days from order to delivery to get here. It’s time for some good music. It DOES make sense to check your homepage from time to tome. I’m thrilled and delighted and thankful for itunes (I couldn’t have waited for much longer than the download time). I always adore listening to your 1st album, Kiss & Say Goodbye, My Town, Tell My Sister, Complainte Pour St. Catherine. I love Andrew Gold’s lead guitar: amazingly bright chorus sound fills and flourishes. I also love Steven Gadd’s drumming throughout. Talk to Me of Mendocino. All the songs are gems of musicianship, instruments and harmonies in every moment. 1) What’s the order in which you, Anna, and Kate respectively learned how to play the many musical instuments you play? 2) What instruments did your father teach you each to play? Tonight I loved watching Complaint for St. Catherine on YouTube with Kate on squeezebox, Anna on piano, electric guitar, fiddle, great harmonica—an altogether wonderfully cohesive musical blend. Thank you so much Anna for releasing this; just ordered it on amazon and cant wait to hear it. I was blessed to see you and Kate perform many years ago at the Bottom Line. I still remember all you in your pajamas. One of the best, most authentic shows I’ve ever seen. additional notes about the songs. <Liked it! I “found” the McGarrigle sisters in their early days and now, in my 80th year, I’m trying to get both Oddities and the latest tribute albumn. Australia is a long time away but I lived in Montreal in the mid 70’s. I collect the wonderful music of you and kate since a couple of months, I am totally blown away by your heavenly voices, anytime again when I listen to your records ! 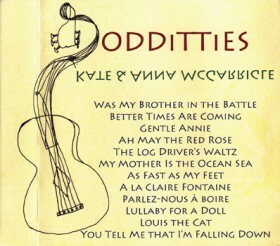 I am searching for the Oddities-cd but unfortunately I can’t find it anywhere ?? Please tell me how I can buy one ? Or even more beautiful send me one, tell me how much it costs. I’ve been searching for the Oddities CD everywhere for my mother for her birthday. I’ve been searching two years for it. I’ve had it on order at HMV for almost a year now, still no news. I’m in Montreal, so I thought it would be easier to get my hands on one. The copies you had ordered in 2010 must be all sold. Are you thinking of having more ordered? Thanks so much! Hi Anna, I listened to your group’s performance of the song “My Mother is the Ocean Sea” on youtube, and it is transcendentally wonderful. I want so much to buy a recording, but it’s not available for purchase anywhere I’m aware of. Please consider making it available somehow. The studio version of My Mother is the Ocean Sea is on Odditties with the same personnel. The youtube video is the property of the Winnipeg Folk Festival and I haven’t heard of any plans to release this song on a compilation. I’ll look into it though. I watched “Not so Silent Night” last night, so, so wonderful. I loved the shirt Lily had on, a McGarrigle shirt from “Love over and Over”. sure wish they were available to buy. Also, so happy to hear “you Tell me that I am falling down” and “Fast as my little feet” on Oddities. We had a mutual friend Anna, Robert Bower, who was the kindest person I know. I met him in the 1970s standing on line for one of your shows. We remained friends until his passing and often attended your concerts together. I actually found out about his passing from your website… He never spoke much about his illness. He is missed ever time I listen to Leonard Cohen or the McGarrigles. Four-and-one-half years on now, is there anything to report? I am surely not alone in my eagerness to hear this! Hello. I am a retired police lieutenant (U.S. Capitol Police), 75 years old, married, 4 kids, 8 grandchildren and living in Waldorf, Maryland. AND a big fan of your music, yours and your late sister, Kate. I also lost my sister in 2007, lung cancer, so I can relate. Anyway, main reason why I’m writing this. I’ve purchased all your CDs and have two favorite songs of yours that I play everyday and know by heart, “I Eat Dinner” and “Why Must We Die.” Super songs. The Best! And my request to you is can you recommend any of your songs that are in the same subject manner as my two favorites so hopefully I’ll have and can add to my music playlist. Any suggestions, please. Your reply would be most appreciated. Thank you for your time and consideration. And thank you for your music.